We’d love your help. Let us know what’s wrong with this preview of Runemarks by Joanne Harris. Maddy Smith was born with a rusty-coloured runemark on her hand - a symbol of the old gods and definitely cause for suspicion. For magic is dangerous. Or so everyone thinks. But Maddy enjoys working magic. Even if it is just to control some pesky goblins. And every time her friend, One-Eye - a good-for-nowt Outlander - comes by, he teaches her more and more about the gods and the runes. Now he wants Maddy to open Red Horse Hill and descend into World Below to retrieve a relic of the old gods. Otherwise it is likely to be the End of Everything. Again . . .
To ask other readers questions about Runemarks, please sign up. Hi I've read The Gospel of Loki a while back and I'm not sure where this book fits in. Is Runnemarks a sequel or a prequel or does The Gospel stand alone and this is a new story? I have the Corgi paperback edition (9780552555753) with the blue cover. Does anyone know if any of the other editions have a larger type size? This one's a bit small for me. This is a dense and sprawling satire that draws on Norse mythology and folklore on which the author has certainly done her research. She re-imagines the Norse gods and on occasion subverts them. Maddy Smith is the young heroine shunned by family and community. She was born with a new runemark on her hand denoting the gods. In her world, magic is perceived to be dangerous and banned. But here's the thing, Maddy likes doing magic.....particularly when it comes to some troublesome goblins! Maddy's o This is a dense and sprawling satire that draws on Norse mythology and folklore on which the author has certainly done her research. She re-imagines the Norse gods and on occasion subverts them. Maddy Smith is the young heroine shunned by family and community. She was born with a new runemark on her hand denoting the gods. In her world, magic is perceived to be dangerous and banned. But here's the thing, Maddy likes doing magic.....particularly when it comes to some troublesome goblins! Maddy's only friend is Old One-Eye (Odin) and she finds herself being tutored on magic by him. A worried Old One-Eye wants Maddy to go on a quest to locate the Whisperer in the World Below. Upon entry, Maddy comes face to face with a familiar goblin. We go on to encounter shapeshifters, enchanted apples, magical creatures, a prophecy and the wonders and joys of Lucky (Loki), a smart, comic and infinitely complex god. Maddy has to stop the Nine Worlds from falling into chaos, and there is, of course, a battle. I have read this book first in 2011. Back then I did not even theorize this could get a sequel. But it has. And I am glad for it. This book can be seen as stand-alone book but there were some loose ends for which I didn't give this book five stars. Neither will I this time, but in any case, it deserves to be 4.25. And, damn I forgot how much this book was fun and enjoyable to read. I usually don't change the date read to the newer one, but this time I did because I read it from the beginning to the end, without ever skipping. This is a high fantasy / unlike our world this has many worlds, although we see only a couple of them. Norse Gods are the main point here - but the Norse mythology is not quite going by Norse myths, so don't be surprised to not hear anything of Jötunheimr, except that there exists order of Chaos, and Loki is a child of that Chaos who has, along with Odin, swore to be brothers in blood - sworn to each other. Okay, let's be realistic - Loki will always play pranks and tricks and do stupid things, but he is honestly quite, quite smart, but also sometimes foolish and falls on tricks himself. Æsir and Vanir categories of gods are one of the main points (Æsir - Odin, Frigg, Thor, Sif, Tyr, Balder, Loki & Vanir - Skadi, Bragi, Idun, Freyja, Frey(r), Heimdall, Njord...), and author stick with them as well - with putting the right gods in each category. Also, she included most of the myth facts (like serpent (guess who?) above Loki's head when he was captured and tortured until he escaped. ) Even if they were just a little changed. And so on... But never mind that, I am not expert on Norse mythology, although I guess i will go into a bookstore and buy a huge myths book but they are so damn expensive >_<. Anyway, some facts held, some didn't - but it was well executed. To be honest, this whole setting seemed like an alternative universe. Despite humans settling in the Middle World, it didn't seem to be anything like the Earth - I didn't imagine it as Earth at all (I think that was the point)? I am ranting, but the conclusion is: not all things related to the myths are the same, some are inverted or outright changed. If you don't mind that, then read this book because it's fun and worth it. This is not a story of gods only - this is a story of Maddy Smith, and her involvement with the Gods, the world, and destiny. This is a different, and kind of unique story where things do not go as planned, gods are not always who they are, which goes for people too and many things happen. It's a fast paced book and well done in general. When it comes to the facts on the gods, do pay attention, especially hostages situation as that is one of the most important facts one may overlook (like me, first time). Out of all characters, I have undying love toward Loki - I will always love the Trickster god, no matter what **** he pulls. And, I am very happy to see there is this book - The Gospel of Loki - and it's about THIS Loki - which is why some people were confused why Loki was actually somewhat demon and of Chaos, instead of being Jötunn. But here it works. There is Order, then is Chaos, and there are Æsir and Vanir and humans. And it was so well executed. Also - ONE THING - for those looking for romance - ya - fanatasy book - you will probably only get fantasy out of the three. There is no love interest, there IS NO ROMANCE, and it's not really young-adultish. Maybe only at the beginning. AND THERE DOESN'T NEED TO BE ROMANTIC INTEREST, BECAUSE THIS BOOK IS NOT ABOUT ROMANCE, BUT ABOUT THE END OF THE WORLD. In the universe of nine Worlds, Ragnarok happened 500 years ago and gods disappeared and the world just restarted. In the Middle Worlds, magic is now banned and considered work of demons by the new religion - the Order and their people - who worship their own God called The Nameless. It means that stories of supernatural creatures are now banned, stories of gods, goblins, and everything else related to magic. Maddy, a 14 year old girl, was born in the village called Malbry, into the family of Smiths. Her father, Jed, and her sister, Mae, never really wanted her. In fact, she was an outsider - and that was all they needed to shut her out from their lives. Why did this happen? Maddy was born with a rune on her hand... except she didn't know what it really was, what it did, except that it was only the mark which branded her as a witch and possible spawn of the demons. Maddy tries really hard to fit in with the rest of the village, but the only person she found herself comfortable with is none other but One-Eye, a mysterious old man who knows more than he wants to tell Maddy. And so on and on. As you can see - everyone hates Loki. I really pitty him. (Sometimes don't, but I do love him the most). Out of everyone, I really, really loved Loki. I had so many feelings about him and (interestingly, I was always on his side). It's not easy being Loki, especially when he did many things that cannot be irreversible - and the Gods knew what they invited when they "adopted" Loki. Odin knew at least but still has a lot of feelings about Loki he cannot discard. Maddy is really good and interesting heroine. She is not boring and she is lovely. She is not annoying and she is rather capable (although it sometimes takes time to understand everything for her). I also really, really, loved Sugar-and-Sack, a goblin from the World Below. He is actually really, really cute. If I tell anything else about the characters, it would be too many spoilers. It was fun, it was angsty, it was interesting and captivating. I reread this book (and wrote a review of it right now), because I wanted to continue on the second book, which was thankfully translated by my publisher and I have it sitting on the shelf for a year or two. It's about time I finish with this story (and move on on the The Gospel of Loki). In other words: I don't think you will regret reading it, unless you are the type who cannot stand changes when it comes to Myths and Legends of the Norse Mythology in general. ⚠ Standalone: Yes. But also, part of a series. Recommended to read the sequel as it covers the loose ends. ⚠ Love triangle: NO, ACTUALLY, THERE IS NO ROMANCE HERE AT ALL. Looking for something lighthearted to clear your head between longer and more complex series? Why not Zoidberg Runemarks? Rating could have been lowered but this was fast and fun read and it was perfect counterweight to complex Malazan series that was reading along side it. so i'm going to give it 4 stars. It's YA fantasy but it's more inspired by older heroic fantasy with than modern YA genre. Distinctive writing style that flows easily and setting heavily inspired by Norse mythology contribut Looking for something lighthearted to clear your head between longer and more complex series? Why not Zoidberg Runemarks? Rating could have been lowered but this was fast and fun read and it was perfect counterweight to complex Malazan series that was reading along side it. so i'm going to give it 4 stars. It's YA fantasy but it's more inspired by older heroic fantasy with than modern YA genre. Distinctive writing style that flows easily and setting heavily inspired by Norse mythology contribute to high rating. The Nordic mythical foundations of this book were well utilised, conforming to known stories in parts and freely reimagined in others. The initial part of the book was especially well done; though it begins with the usual young protagonist coming into their powers, the runemarks and character of Maddy Smith gave it a real freshness and appeal. However, the book felt stretched, pushed well past the moment when all the reader's attention is firmly focused. By the time of the big battle conclusion, I was there merely to see how it all ended rather than being invested in the outcome. Joanne Harris usually has a much tighter plot than this and I was surprised by feeling this way about one of her books, especially as I thought this was for more of a teen audience. Perhaps i'm doing them a disservice in thinking that they have even less patience and attention than me... In any case, i'm not sure i'll be reading the next one in the series. Kindle copy received from Netgalley. This was a really fun way to spend some reading hours. It's YA Fantasy, which I wouldn't normally read, but Harris's style proved too seductive for me. She laid out a trail of breadcrumbs from the first paragraph and before I knew it I was deep inside the mountain, and the story. Caught, and mesmerized, there was no way out, but through it. I will admit to one or two brain spasms along the way as I tried to make sense of the complex Norse mythology, with which Harris deviates from the convention This was a really fun way to spend some reading hours. It's YA Fantasy, which I wouldn't normally read, but Harris's style proved too seductive for me. She laid out a trail of breadcrumbs from the first paragraph and before I knew it I was deep inside the mountain, and the story. Caught, and mesmerized, there was no way out, but through it. I will admit to one or two brain spasms along the way as I tried to make sense of the complex Norse mythology, with which Harris deviates from the conventional storyline. But, given that it is all mythological who is to say after all, which is the better tale that's told? Harris's telling is beguiling. Maddy proves to be an enchanting young heroine -- all the more glamorous because she lacks glamour and instead moves with integrity, innocence and honour. What comfort to YA readers to know that one of their "own" is incorruptible, straightforward and strong! While a few other readers have commented that "nothing happens" and that Maddy is purposeless, I would beg to differ and suggest a closer re-reading: sometimes it's the journey that counts, and not the destination. Even from my more mature wisdom, this was an enjoyable read. When I put myself back in my 12-year-old body, under the apple tree, this book was positively delicious! My main complaint about Runemarks was the complexity. The narrative was far too extensive and unfocused. I don’t know much about Norse mythology, so I found myself frequently frustrated with the intricate and complicated Norse histories. I usually prefer being eased into a new world where I’m given time to absorb the characters’ personalities and different politics, etc. It wasn’t my taste. Έχω διαβάσει αυτό το βιβλίο μπορεί ίσα με 10 φορές (στην κυριολεξία). Θυμάμαι την πρώτη φορά που το διάβασα πήγαινα γυμνάσιο και ντρέπομαι που το λέω αλλά δεν είχα ιδέα έστω ότι υπάρχει κάτι που λέγεται σκανδιναβική μυθολογία. Το είχα πάρει από τη Δανειστική Βιβλιοθήκη με μισή καρδιά γιατί ούτε το εξώφυλλο με τρέλαινε, ούτε ο τίτλος και η περίληψη στο οπισθόφυλλο μου φαινόταν τελείως κλισέ. Και πραγματικά πιστεύω πως τόσο πολύ έξω δεν έχω πέσει ποτέ με άλλο βιβλίο! Δεν μπορούσα να το πιστέψω! Με κ Έχω διαβάσει αυτό το βιβλίο μπορεί ίσα με 10 φορές (στην κυριολεξία). Και πραγματικά πιστεύω πως τόσο πολύ έξω δεν έχω πέσει ποτέ με άλλο βιβλίο! Δεν μπορούσα να το πιστέψω! Με κάθε σελίδα που διάβαζα κολλούσα όλο και πιο πολύ. Έχω την εντύπωση πως αυτό που με ενθουσίασε περισσότερο, εκτός από τους χαρακτήρες που ήταν όλοι ένας προς ένας, ήταν το γεγονός πως δεν ήξερα που θα καταλήξει το όλο πράγμα. Θέλω να πω στα περισσότερα βιβλία, φαντασίας, αστυνομικά, αισθηματικά, ξέρεις λίγο πολύ πως θα τελειώσουν: αυτό που ψάχνουν στο τέλος θα το βρουν, θα τον σώσουν αυτόν που κινδυνεύει, θα τον πιάσουν το δολοφόνο, μετά από όλες τις αντιξοότητες και τα εμπόδια θα καταλήξουν μαζί ευτυχισμένοι. Στην προκειμένη περίπτωση, διάβαζα, διάβαζα, περνούσαν οι σελίδες, συνέβαιναν του κόσμου όλου τα γεγονότα και οι αποκαλύψεις και δεν μπορούσα να μαντέψω τι θα συνέβαινε στο τέλος. Βέβαια έφταιγε και λίγο το γεγονός ότι από σκανδιναβική μυθολογία δεν είχα ιδέα. Πιστεύω πως αν γνώριζα και 5 πράγματα κάποιες από τις εξελίξεις ίσως και να τις είχα προβλέψει. Και εννοείται πως αφού το τελείωσα, καθόμουνα και έψαχνα στο ίντερνετ ότι υπήρχε και δεν υπήρχε για τους θεούς, μύθους και ιστορίες. Και τη 2η φορά που το διάβασα ήταν ακόμη καλύτερο. Θες λίγο που ήξερα και 2 πράγματα για τους σκανδιναβούς θεούς, θες λίγο που δεν είχα τόση αγωνία για το τι θα γίνει στο τέλος και επικεντρωνόμουν στις λεπτομέρειες; Δεν ξέρω σίγουρα. Και το ξαναδιάβασα…και ξανά…και ξανά…και ακόμη δεν το έχω βαρεθεί να πω την αλήθεια. Από τα πιο ωραία βιβλία φαντασίας που έχω (ξανα)διαβάσει. Πολύ κρίμα που δεν μεταφράστηκε και η συνέχεια (η οποία είναι επίσης εξαιρετική). Recommended to Helen by: One of those "pimp your fandom " posts that mentioned shenanigans. A lot. I made one big pause while reading, so my thoughts are not 100% coherent; I also don't have time for a detailed review right now. I'll just say what made me decide on five rather than four. -Despite target audience, it is much less Bleached Underpants than many other interpretations of Norse Mythology. Also, no Black&White here. -The recommendation mentioned "shenanigans", but it's not as much about I made one big pause while reading, so my thoughts are not 100% coherent; I also don't have time for a detailed review right now. I'll just say what made me decide on five rather than four. -The recommendation mentioned "shenanigans", but it's not as much about shenanigans as deception. Layers upon layers of it. It is clear enough not to cause a headache or blink-or-miss-it, but the hints drop just before the reveal so you don't have to spend pages rolling your eyes and wishing the character would get it already. -Also, it featured one my favourite kind of plot twist which I cannot name because it is a major spoiler and I really don't want to spoil anything here. Firstly, this cover looks stunning in person with its gold accents and that combined with the synopsis made me instantly buy it because who doesn't love a little bit of mythology?! Well, this was absolutely filled to the brim with Norse mythology, which was super exciting because I love mythology, but it didn't make for a nice reading experience since you were just constantly overloaded with information about each of the gods and the Nine Worlds. Due to this, the pace just kept getting interrupt Firstly, this cover looks stunning in person with its gold accents and that combined with the synopsis made me instantly buy it because who doesn't love a little bit of mythology?! Well, this was absolutely filled to the brim with Norse mythology, which was super exciting because I love mythology, but it didn't make for a nice reading experience since you were just constantly overloaded with information about each of the gods and the Nine Worlds. Due to this, the pace just kept getting interrupted because you'd have to stop and take in all the information, and then the next page or chapter, you'd be reading from another perspective or within a different storyline. That was another thing that irked me, there was the story with Maddy and the gods, and then another which crossed over with theirs involving those from the village.... Let me tell you, that storyline was very uninteresting and made me quite sad when I had to go from the gods and Maddy using runemarks to dealing with the villagers. I believe this title is targeted at a YA audience, which typically is anywhere from 12 and up (who knows these days though), but I can't see many younger readers being interested in this...? As always, this is my own opinion and perhaps this just didn't end up being a title for me and others may love it instead! However, it could have been an exciting book if perhaps it was stripped back a little since it's only the first book. That being said, there's only one other in the series and that was published a whole four years later. HOW HAVE I NOT READ THIS BEFORE??? I mean, I know why, because in my opinion the summary for this book doesn't really do it justice. Or maybe it does, but it doesn't necessarily highlight the parts of the book that make it most appealing to me personally. First of all, I feel like the summary/cover makes this seem more like a middle grade book, but it is definitely YA. Don't get me wrong, I don't mind middle grade books, but with the complexity of the story here I'm glad it was aimed at a slight HOW HAVE I NOT READ THIS BEFORE??? I mean, I know why, because in my opinion the summary for this book doesn't really do it justice. Or maybe it does, but it doesn't necessarily highlight the parts of the book that make it most appealing to me personally. First of all, I feel like the summary/cover makes this seem more like a middle grade book, but it is definitely YA. Don't get me wrong, I don't mind middle grade books, but with the complexity of the story here I'm glad it was aimed at a slightly older audience. Also this is YA WITH A FEMALE PROTAGONIST WITH ABSOLUTELY NO ROMANCE OR LOVE INTERESTS [POTENTIAL OR OTHERWISE] WHATSOEVER. What a breath of fresh air! Secondly, to me the summary reads like the book is going to feature Norse mythology but not feature the gods heavily I guess? I didn't know that Harris' The Gospel of Loki was also technically a part of this series or I would have realized my mistake earlier, but anyway the gods are VERY present in this. Pretty much all the major players make an appearance at some point but Odin and Loki are the main ones, and if you know me then you know how much I absolutely adore anything with Loki in it! In the end I thought there was a nice balance between the gods and the human characters and I really liked how all of their plots came together at the end. Characters: MADDY is an excellent heroine. She's not too perfect, but well-meaning, brave, daring, and affectionate without mush. She's not fluffy or weepy and she doesn't have an attitude. If in the one part she's momentarily whiny it's understandable and she stops very soon. And can she throw a mind bolt! ONE-EYE, Odin, is a puzzle to Maddy. Her friend, mentor; but is he only utilizing her? LOKI--unpredictable. Charming; scarred; a rogue; snarky to the limit, with a dark past. If you asked him Characters: MADDY is an excellent heroine. She's not too perfect, but well-meaning, brave, daring, and affectionate without mush. She's not fluffy or weepy and she doesn't have an attitude. If in the one part she's momentarily whiny it's understandable and she stops very soon. And can she throw a mind bolt! LOKI--unpredictable. Charming; scarred; a rogue; snarky to the limit, with a dark past. If you asked him if he cared about any one, or regretted anything, he'd deny it with a grin, and be lying. I defy you not to be hoping he stays on the light side, or glad every time he shows a bit of goodness. And the rest of the very large, very complicated cast. It would be spoilers to mention some of them. Let's just say that the author knows her myths, and there's a pot-bellied pig too. Plot: Read the book description for basics. The plot is epic. It goes on and on, picking up characters, places, themes. I can't say much without spoilers. Writing: Once in a while a character (especially Loki) speaks in a too-modern fashion. Apart from that, the writing is gorgeous, dark and funny, magnificent, gentle sometimes. It's not Rosemary Sutcliff, but it's very good. Content: Here are the problems. 4 S-words of one sort or another. I don't like vulgarity, and most books I read do not have it. If I buy this one I will use the black pen on it. Other words were p*** and d***, which don't bother me quite as much. Nothing sexual to speak of, some violence. Also the antagonistic Order seems to be a representation of Christianity, and the gods seem at times to be identified with demons. However, by the end, the Order's god is revealed, and is nothing like God; and gods and demons seem to be separate things. I loved the story and characters so much that I followed my friend Hazel's example and gave bonus points so it still is five stars. And finally, brethren: Suitable for perhaps 16+, or younger if language doesn't bother you or you have an obliging person to mark out the baddies; girls or boys. Recommended for Norse mythology fans, epic fans, Loki fans, adventure fans, and fans of dark humor. Joanne Harris has written a fast-moving story with a young heroine, 14 at the time of the dramatic action, set 500 years after Ragnorok in a world that derives from Norse myth. I've read dozens of books of myth and folktale over the years, as well as books that draw inspiration from the originals, and Harris's creation is fresh and satisfying. I have mixed feelings about this book. I guess I'll start with the positive things about it. First off, it's well-written, the Norse mythology is accurate and it has quite an imaginative adventure. There were so many things happening all at once that I failed to get a firm grip on the story and digest it thoroughly. It felt like too much information for a single book- it could have easily been two books. Therefore, I did not feel I got to know the characters and process the story in a deep I have mixed feelings about this book. I guess I'll start with the positive things about it. First off, it's well-written, the Norse mythology is accurate and it has quite an imaginative adventure. There were so many things happening all at once that I failed to get a firm grip on the story and digest it thoroughly. It felt like too much information for a single book- it could have easily been two books. Therefore, I did not feel I got to know the characters and process the story in a deeper level. I don't know about you guys, but I think that one of the most important things about a story is how well you get to know a character. In this book, I feel that the author merely skimmed the surface of her characters. Secondly, I feel that the story did not offer a full explanation of Norse mythology- its almost like you are expected to know about it already. Finally, and this is just my opinion, it stirred nothing inside me. Yes, it was a fun and entertaining read but that's about it. I don't know about you guys, but I like books that make me feel intense emotions- like empathizing with the characters. This book, did not do that for me specially because the characters, in my opinion, lack depth. AWESOME! I AM OBSESSED WITH THIS BOOK, DO YOU HEAR ME? AWESOME! "Runemarks" is based on Norse Mythology, and the witty and surprisingly colorful cast of characters includes many Norse Gods (including Loki the Trickster, Odin the All-Father, and Thor the Thunderer), several hilarious goblins (my favorite of which was named Sugar-&-Sacke), and quite a few persnickety, clever, and downright serendipitous humans (including Nat Parson, his wife Ethelberta who is not all she seems, and the uptight AWESOME! I AM OBSESSED WITH THIS BOOK, DO YOU HEAR ME? AWESOME! 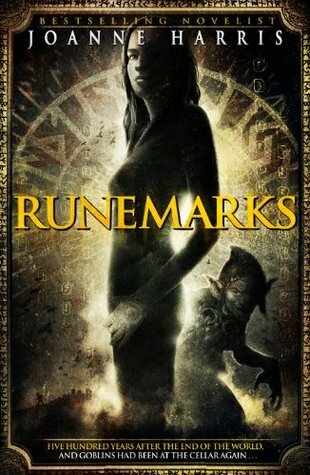 "Runemarks" is based on Norse Mythology, and the witty and surprisingly colorful cast of characters includes many Norse Gods (including Loki the Trickster, Odin the All-Father, and Thor the Thunderer), several hilarious goblins (my favorite of which was named Sugar-&-Sacke), and quite a few persnickety, clever, and downright serendipitous humans (including Nat Parson, his wife Ethelberta who is not all she seems, and the uptight Mrs. Scattergood). But of course, no one can forget the book's main character, the clever and brave Maddy Smith, a fourteen-year-old with a "ruinmark" (runemark) on the palm of her hand, an ancient and mysterious symbol that signifies the Seer-folk blood she is scorned for and the magic that she is able to preform. Now this book is so complicated, that first off, you may wish to know that this will be a rather complicated review (actually, this is probably false; it could be a very boring and rushed review). Sometimes, I overreact to complications, therefore, this review may unintentionally be a manifestation of Chaos (nearly definitely). Secondly, I liked it [the book [Runemarks]] better the second time I read it. Thirdly, I liked it a great deal the first time, but something just didn't click. Fourthly, THIS BOOK IS THE PREEMINENT OF ITS CLASS. And that could be the end of the story, yet that would make an extremely poor assessment. Indubitably, this incessant rambling is the cause of greatest tire, so I find myself in the need to immediately portray my thoughts through use of my will to dominate the cunning of words. Shall we forthwith proceed onward? Good. I so very much liked the characters that I will start with them. First of all, some of them were very confused with their loyalties and that made me a little edgy with them, but that was completely my fault and they were probably in the right. Whom all do we have here? Um… Loki. A parson (quite likely not what you're thinking, at that) as well. Let's see, I'll just give it a long shot and list off some (I'll elaborate later)… there's of course the main character, Maddy (excellent character), One-Eye (a first-rate chap in his own way. And guess how many eye(s) he has? ), Loki (this second mention is definitely necessary, for more reasons than one) (Loki is basically like Loki, but better, in a Loki-ish way. This is a paradox. There isn't more than one Loki. In a way, at least. ), then there's the rest of the Æsir and Vanir; excellent fellows, I'm sure. Which brings us to the question; is Thor and his hammer or an old lady with her walking stick more powerful? Hard to decide, isn't it? But you get to find out… sort of. Also, there is good old Mimir. Yep, that poor fellow. And then there are a lot of creatures and humanoid beings that are less than charming (one's in a constant state of being literally half dead), and then there's Skadi. Yes, that Skadi, The Huntress, hater of Loki. Are you starting to get the picture? Loki and Skadi in the same paragraph is never a good sign. For characters in the story, that is. For a reader, it's one of the best. There's also Adam Scattergood. Of course, he's a troublemaker. Due to my experiences, every time I see the name Adam on a page, I become fairly certain trouble is ahead. I couldn't forget the pig, of course; best of swine, I'm sure. And I shouldn't forget to mention that really poor (not by way of monetary means; unfortunate is a synonym) but great creature who appears at the beginning of the book… but I won't elucidate about him and this sentence probably won't help you any. Did anybody mention the giant snake? Oh, wait, I'm the one "talking," and, according to my research, I didn't. Guess who's scared of snakes? Hint. It isn't a whole bunch of the characters. Hint two. Really, really scared of snakes. Hopefully, that wasn't helpful. You really should read the book yourself to find out this stuff. I tire of talking about characters now, so let's move our good attention vertically at a descent forthwith! If you're moving horizontally, there may or may not be a problem. Was the plot good? Affirmative. In fact it was a monstrously well done plot. It is also the most twisted (for want of a better word; twisted sounds more formal than twisty) and complicated plot you've ever seen. Maybe. Of course, just the fact that runic magic along with the spoken word is being utilized makes the whole thing interesting. And then you take in the aforementioned characters and a host of others, and it starts becoming nonnegotiably (this isn't an accepted word?) fascinating. And then you add the setting, and it gets so good your dog might get excited (which would be… bad). Hold! Add the setting first. What would the poor characters do without good solid mass to place their feet on or oxygen or nitrogen to breath or ozone to consume the ultraviolet rays from the sun? It's horrible. Can you tell that I wrote some of this review at 3+ A.M. in the night? Back to the review. So, basically, there's this youth denominated as Maddy. She is not exactly ordinary and she lives among a people that live by a set of standards and try to avoid contact with the unnatural, to put it one way. What I've just said covers such a small portion of the boundless plot. This could be an entire plot, with development, of course, but, oh no. It goes on. She meets this chap with one eye, strikes up a "friendship." He has her go down underground and try to fetch something. This causes all kinds of events (too numerous to explain). One of these, though, is the waking of some people. Poor people. And then there's this person who appears in the readers stretch of "vision." Then a great deal more bizarre things happen. There's a poisoned handkerchief, many plots (strategic schemes, that is) thought out by many different people (hence the poisoned handkerchief), and a pig in the Underworld. But, isn't there just being a underworld and over-world too simple? It is and this was remedied… but I won't tell how… I believe, however, that you can guess. Yes, I can conclude, saying that this was a decidedly complicated, interesting, and enjoyable diegesis. Conclude this section, that is… I must needs communicate my thoughts upon the writing. The writing was done proficiently, both in style and turn of phrase. It did the job of carrying the plot and projecting the characters expertly, to the extreme happiness of the reader and no small amount of merit to itself. It was very captivating and all that good stuff. And then the novel falls just a little short of its mighty potential. The characters use some pretty rough vocabulary sometimes. I'm afraid I won't be much help with giving you a general impression of what sort of words, for the same in the copy I read were covered in ink, black and blue. As for in-book content, this brings us immediately to the discussion of the magic (or glam) used. The idea behind it is most interesting, having, as I said before, Runic magic along with cantrips. It doesn't really tell how it all works, but that, as usual, is very much acceptable. Runes are cast, which is very interesting, no? This is an amazing concept. It really is. Just think about it for three minutes. It, it, and only it; and you'll start to see just how amazing. The runes, of course, have meanings, and there is a great deal of them. Very good. Cantrips, of course, are uttered. That's all fun stuff too. Nos primeiros dez anos da sua vida, Joanne refugiou-se na leitura, nos dez anos seguintes escreveu histórias a imitar as dos seus autores preferidos e depois, finalmente, começou a escrever as suas próprias histórias mas houve uma história, escrita durante os seus dezanove anos que a autora acabou por recuperar, uma história inspirada pelo seu amor à mitologia nórdica, originalmente chamada Witchlight e que foi recusada pelos editores devido ao seu tamanho, complexidade e obscuridade. Esta história um dia saiu da gaveta e tornou-se uma história de mãe para filha, uma história que Joanne lia e adaptava para a sua filha Anouchka, uma história divertida e privada até a filha de Harris a convencer a publicá-la e assim nasceu A Marca das Runas. Publicado em 2007, e reeditado agora pela ASA, editora da autora em Portugal, este é o primeiro volume da duologia de fantasia da autora de Chocolate, uma série juvenil que não deixa de apresentar a profundidade sombria de Joanne mas que contém diversão, mitologia e aventura e, mais uma vez, o combate entre magia e religião. Maddy nunca foi uma menina como as outras. Renegada desde a nascença por causa da marca que apresenta na pele, Maddy é uma estranha na sua própria casa, olhada de lado pelos que a viram crescer, diferente em todos os aspectos, ela sonha com outro mundo, onde não seja uma estranha, um símbolo de algo que é temido e há muito esquecido… mal Maddy sabe que algo está mudar, que o que está adormecido voltará, que a magia está mais entranhada nela do que alguma vez ela pode supor e que está na hora de ela cumprir a sua parte nos desígnios do destino. Encarregada de uma missão, ela parte para o desconhecido e descobre que as fábulas que o seu mentor lhe contava são mais reais e perigosas, que existe um inimigo que está prestes a torná-las nada até ao esquecimento absoluto, que ela própria é muito mais do que aparenta. Numa guerra onde o Caos e a Ordem se enfrentam mais uma vez, inimigos tornam-se amigos, aliados mudam de lado e uma Nova Era pode morrer antes de puder crescer. Autora que brilha em livros esotéricos de alguma estranheza e muita complexidade, Joanne dá-nos este A Marca das Runas, um livro juvenil de fantasia, muito diferente do seu estilo habitual mas que não deixa de surpreender, nem que seja pelo lado refrescante e divertido, jovem e espirituoso, uma faceta desconhecida da autora, cujos livros pontuam, por regra, pela densidade e obscuridade. Numa linha mais simples mas com a mesma escrita envolvente que perde o seu lado tentador pra um mais ingénuo e satírico, a autora de Chocolate mostra que quando se nasce com um dom se pode escrever qualquer coisa, até uma fábula de aventuras, demandas e objectos mágicos. Mas desenganem-se se pensam que este livro é uma leitura básica e banal, muito pelo contrário, está repleta de segredos, profecias e ligações obscuras que se unem numa narrativa de acção rápida e momentos únicos que nos levam a ler a toda a velocidade. Onde as gargalhadas são sempre bem-vindas, o inesperado acontece nos momentos menos propícios e o coração se aperta quando só queremos que tudo acabe bem, a mitologia nórdica ganha outra graça e dimensão, uma versão mais colorida, trapaceira e trapalhona que nos faz voltar à idade em que acreditávamos em tudo e em que o entusiasmo era quase infantil e extravagante. Mesmo assim, como sempre, a autora não nos deixa de espantar com a forma como o Bem e o Mal são uma única e só moeda, como ambos os conceitos se entrelaçam e desmontam dependendo da perspectiva de cada lado, mostrando que por baixo da cor e risada há uma mensagem mais profunda do que transparece a um primeiro olhar. Também este livro é marcado pelos temas habituais. O conflito entre a religião e a magia, a fábula e a realidade, a ordem e o caos, pautam toda a narrativa, onde as coisas não são tão lineares quanto aparentam e que são apresentadas de uma forma tão imaginativa pela autora, que cada descrição nos faz viver os acontecimentos, deixando a nossa mente voar mais longe pelas páginas ao encontro das milésimas tarefas que Maddy e companhia cumprem ao longo da sua jornada. Em cada momento nota-se que este é um livro feito por diversão, um livro para extravasar ideias, para fazer rir e abrir os olhos mas com a certeza que respiraremos de alívio no fim, pelo menos até ao próximo livro. As próprias personagens são tal como a narrativa em que se inserem. Ingénuas, rezingonas, irónicas e divertidas, um grupo para nos animar e enternecer que colocarão até ao fim da leitura a visão Marvel longe das nossas mentes. Desde os deuses aos habitantes da aldeia, cada um apresenta um conjunto de características que nos impedem de odiar profundamente e apelam ao perdão e isto, sendo um factor que algumas personagens de Joanne chegam a apresentar em outros livros, acaba por ter a sua certa ironia porque estas personagens são tão menos pesadas e intricadas que apelam desde logo ao nosso lado bom. This review has been hidden because it contains spoilers. To view it, click here. Sarò sincera: se non avessi saputo che nel libro sarebbero comparse le divinità nordiche non l'avrei letto: trovo la quarta di copertina veramente brutta e poco interessante. Nessun motivo in particolare, proprio prima impressione a pelle. E un'altra cosa: nonostante abbia letto ben due recensioni, ero convintissima che si trattasse di un urban fantasy... quindi ho passato un certo numero di pagine a chiedermi dove e quando fossimo. La risposta è abbastanza semplice: sul quando, siamo qualche seco Sarò sincera: se non avessi saputo che nel libro sarebbero comparse le divinità nordiche non l'avrei letto: trovo la quarta di copertina veramente brutta e poco interessante. Nessun motivo in particolare, proprio prima impressione a pelle. La risposta è abbastanza semplice: sul quando, siamo qualche secolo dopo Ragnarok. Sul dove... siamo in un mondo fantasy generico, che mi ha ricordato un po' Mondo Disco (sempre per il motivo che al mio cervello piace fare connessioni completamente random) tranne che la magia è IL MALE: in seguito alla fine del mondo il mondo non è finito, si è "solo" riassestato. Le antiche divinità sono morte o divenute ombre di sé stesse; tutto ciò che è legato al vecchio è una minaccia per la nuova magia, ma il nuovo ordine è pericoloso perchè vuole essere unico e totalitario, e pertanto mira ad infrangere l'equilibrio. Che dopo aver letto tre fantasy sai già che è una pessima idea anche se non ti spiegano nel dettaglio perchè. La cosa interessante è che ad infrangere la situazione di stallo venutasi a creare nel corso dei secoli non sono i cattivi ma la protagonista: Maddy, 14 anni e reietta nel proprio paese per via di una troppo spiccata propensione a usare la magia, è destinata ad essere l'ago della bilancia nella lotta tra vecchio e nuovo, e per esserlo deve dare il via ad una sequenza di avvenimenti così folli che nessuno sano di mente lo farebbe volontariamente (e diciamocelo, se hai un piano a cui persino Loki dice di no perchè non ha senso, hai un bel problema tra le mani). Maddy è una protagonista che ho amato un sacco: tanto per cominciare è una ragazzina che si comporta da ragazzina, è matura come possono esserlo i bambini. Ossia prendendo un sacco di decisioni sbagliate. Rimane quella con l'atteggiamento più normale ma questo perchè le divinità hanno un'età media mentale che va dai 3 ai 5 anni: alla fine mi aspettavo che Maddy avesse una crisi di nervi e facesse presente che, nel mucchio, la bambina era lei. Ho trovato ben gestiti i suoi poteri, nel senso che li ha, sono grandi ma non li sa usare: per tutto il libro la si vede generalmente lanciare in avanti la sua malia contando sul fatto che è essenzialmente l'unica a cui funziona ancora del tutto (i vantaggi di essere nati dopo Ragnarok... ), ma per il resto personaggi con più esperienza sono in grado di farla a pezzettini piccoli piccoli. Ad affiancare Maddy nelle sue avventure c'è Loki, che vuol dire che io ero contenta e Maddy non tanto perchè cosa c'è di meglio che affrontare La Fine del Mondo 2.0 in compagnia di un trickster dio del caos, che incidentalmente ha causato La Fine del Mondo 1.0? Loki l'ho amato: un demone adottato da Odino come fratello, portato ad Asgard e lì disprezzato da tutti perchè... beh, perchè si comportava da demone. Ad ogni modo questo Loki non è un grande incompreso: sì, gli Æsir non sono stati molto carini con lui, ma lui è stato insopportabile nel migliore dei casi. Apprezzo un sacco gli autori in grado di scrivere i caotici neutrali in modo credibile, e questo Loki, pur non essendo l'esempio migliore, si piazza molto bene in classifica. In più, il suo rapporto con Odino mi ha un pochino incrinato il cuore. Ci sono un sacco di comprimari, e un difetto può essere il loro numero: a parte Loki ed Odino (più Thor), che più o meno si sa chi sono, c'è tutto il pantheon norreno che francamente non ho mai sentito nominare salvo qualche eccezzione (tipo Hel, e il cielo sa quanto ho fangirlato per Hel) che è trattato in modo molto macchiesttistico. Beh, non proprio. Diciamo che se fosse un film, loro sarebbero i personaggi da affidare a caratteristi bravi. Ed è un peccato, perchè la Harris è brava a coinvolgere il lettore, per cui almeno io ho trovato fastidiosa la fretta con cui molti personaggi sono stati trattati perchè sono certa che sarebbero stati bellissimi. Per esempio avrei pagato per saperne di più della famiglia di Maddy, di come vivono la caccia alle streghe scatenatasi contro di lei. Il ritmo del libro è strano: è lungo, ma mentre vai avanti con la lettura sembra che le pagine siano troppo poche per risolvere tutto ciò che è stato messo in moto, che la storia proceda troppo lentamente per poter avere un degno finale. E in effetti un po' è così: se la Harris riesce a trovare il modo di integrare il cattivo finale senza farlo sembrare un boss sbucato fuori dal nulla di un videogame, il modo in cui questo viene affrontato è poco convincente e troppo veloce. Per contro, tutto accade nel mondo di Hel, che è una location così figa che fa passare in secondo piano tutto o quasi. L'alternarsi dei punti di vista, poi, permette di seguire in modo completo la trama e la piacevole sorpresa è che c'è anche il pov del cattivo. Saranno pure personaggi sgradevoli, ma mi piace vedere come corre il criceto nella loro testolina... ma i cambi sono abbastanza bruschi, e sinceramente all'inizio mi hanno lasciata un po' perplessa. Joanne Harris... well, it was a love at first word with her and has been so ever since. I have NEVER read a book by her and felt disappointment, regret or mixed feelings. She is a unique human being that has been blessed with the magic of writing and brings joy to the world with ther storytelling. This is Joanne Harris's first novel for young adults. Its the story of maddy Smith a fourteen year old girl who lives in the distant future in a world entirely different to ours. Maddie is born with a m Joanne Harris... well, it was a love at first word with her and has been so ever since. I have NEVER read a book by her and felt disappointment, regret or mixed feelings. She is a unique human being that has been blessed with the magic of writing and brings joy to the world with ther storytelling. This is Joanne Harris's first novel for young adults. Its the story of maddy Smith a fourteen year old girl who lives in the distant future in a world entirely different to ours. Maddie is born with a mysterious rune mark on her hand which in her world is considered a very bad omen. The novel which is quite long for a childrens novel relates Maddie's adventures as she crosses over into the different worlds. On her journey she encounters many colourful characters including norse gods. No-one is quite who they appear to be and who actually can Maddie really trust! There are lots of twists along the way. Joanne Harris in this book demonstates her ability as a storyteller. Although I did feel that she did not explore the character of Maddy strongly enough that said a very readable story. I also would have wished for Loki's character to be a bit more... Well, Nordic... Ever since I read Lachlan's Wolfsangel I have been spoiled by the way he portrays Loki, and so far every other portrayal falls flat for me. I just cannot live with the idea of another Loki, who is to be different to that, which is of course absolute non-sense, for Loki is a shapeshifter above all. But alas, I am a humble human. On the bright side Joanne Harris' writing style is as strong as ever and it is easy to get involved in the magical world she creates. It is all very tongue-in-cheek with humour that owes a lot to the influence of Douglas Adams and Terry Pratchett. It is easy to read and enjoyable as ever. But I find it a bit less influencial than her other works. Nothing can beat the Five Quaters of the Orange or Chocolate for me. It is still very good, although a tiny bit inferior the rest of her novels. This was a pretty good book. Not amazing, but not half bad either--the kind of rollicking adventure, with themes of self-esteem and rebellion against intolerant, controlling leadership, that seems to have taken the world of young adult literature by storm. I had already fallen in love with the subtle overtones of fairy-tale in 'Chocolat,' so when I discovered this, Joanne Harris' first excursion into YA fantasy lit, I picked it up and devoured it eagerly. To say that I was disappointed with the This was a pretty good book. Not amazing, but not half bad either--the kind of rollicking adventure, with themes of self-esteem and rebellion against intolerant, controlling leadership, that seems to have taken the world of young adult literature by storm. I had already fallen in love with the subtle overtones of fairy-tale in 'Chocolat,' so when I discovered this, Joanne Harris' first excursion into YA fantasy lit, I picked it up and devoured it eagerly. To say that I was disappointed with the book would be an unfair exaggeration--but there's no denying it didn't hook me quite as much as Chocolat. Perhaps this is partly due to my utter lack of familiarity with the Norse myths that are the basis of the the story; but Runemarks' plot seemed loose and wandering, with new characters and plot twists introduced with such frequency, and so little explanation, that their significance was often lost on me. That said, Harris' characterizations are delightful. The Trickster Loki in particular is a deliciously cheeky, wickedly mischievous, roguish, irreverent, and impertinent scoundrel who, in true Joanne Harris style, single-handedly redeems the book from any plot pitfalls and keeps readers, like his cohorts, simultaneously laughing at him and wanting to strangle him, and unsure whether he is set to save the world or bring it crashing down into Chaos (which, despite Loki's family connections there, is NOT at all a nice place). What is missing, ironically, is that mysterious spark or zing--that flirting with the supernatural--that indescribable, but tangibly present, whiff of otherworldliness that brought 'Chocolat' tantalizingly close to the borders of Faery. Spells and cantrips--not to mention the eponymous runes of power--are as thick as fog in all nine worlds of the World tree, and gods and goblins run amok; but that magical quality in the former sense is markedly lacking. What made Chocolat so memorable was the way it infused everyday life with a mythical sense of wonder. Runemarks, on the other hand, brings the legendary down into the realm of the everyday. “God’s just a word,” Loki says, dismissing with a single gesture a world of awe and mystery. “Anyone can be a god if they have enough worshippers… Just words people use for things they don’t understand.” Within the story, where the gods may turn out to be the enemy, this idea may be reassuring; but once that awe of the divine has been diminished, the world does seem a colder and less colorful place. So, so, so good! I have always been big on Norse mythology, but have never really read many books about it. When I found this series, I couldn't wait to get started. I was hesitant at first, since my library only had it on audiobook, but now I'm SO glad it ended up that way! This is the first audiobook I finished, and it was much better than the first one I tried! I loved the narrator's voice, and she did an amazing job with the characters and I could easily picture the character's faces based o So, so, so good! I have always been big on Norse mythology, but have never really read many books about it. When I found this series, I couldn't wait to get started. I was hesitant at first, since my library only had it on audiobook, but now I'm SO glad it ended up that way! This is the first audiobook I finished, and it was much better than the first one I tried! I loved the narrator's voice, and she did an amazing job with the characters and I could easily picture the character's faces based on the emotion in her voice! This book was so fun to read (well listen to) that it is now one of my top favorites, AND on my must-buy list! I'm also hoping to pick up Runelight and the Gospel of Loki soon, since neither are at my library. Reread this really quickly to refresh my memory on the plot before I read Runelight. Still enjoyable, although it's kinda lacking in Joanne Harris' usual precise plotting -- this time through, I felt like she made it a bit too convoluted, a bit too... I don't know. I wasn't so impressed by the plotting in The Lollipop Shoes and Peaches for Monsieur le Curé, likewise with this on a second read. Still fun, though, like I said, and even if you know your Norse myth and think you know how it's going t Reread this really quickly to refresh my memory on the plot before I read Runelight. Still enjoyable, although it's kinda lacking in Joanne Harris' usual precise plotting -- this time through, I felt like she made it a bit too convoluted, a bit too... I don't know. I wasn't so impressed by the plotting in The Lollipop Shoes and Peaches for Monsieur le Curé, likewise with this on a second read. Still fun, though, like I said, and even if you know your Norse myth and think you know how it's going to turn out, it can still surprise you. This felt like such a long book...And maybe it isn't the book's fault. Maybe my reading A Conjuring of Light at the same time and being fully immersed in that story didn't leave enough room for this one. I almost didn't read this book to be honest, the cover and the synopsis on the back did little to recommend it. Had it not been for the comments on Goodreads, which gave a greater detail of the story, I never would have read this book. If I were Harris, I would have been enraged at the person who wrote the synopsis because it gave no hint of the great story inside. Prepare yourself for some serious fanpoodling, you have been warned. From the moment of her birth Maddy Smith had always been an outs I almost didn't read this book to be honest, the cover and the synopsis on the back did little to recommend it. Had it not been for the comments on Goodreads, which gave a greater detail of the story, I never would have read this book. If I were Harris, I would have been enraged at the person who wrote the synopsis because it gave no hint of the great story inside. Prepare yourself for some serious fanpoodling, you have been warned. From the moment of her birth Maddy Smith had always been an outsider in the little rural community into which she had been born. Some five hundred years after Ragnarök mankind is now captivated by something called the word and people are told not to dream and most certainly not to perform any kind of magic. Born with a runemark on her hand Maddy is capable of performing various kinds of magic but she has no idea how much until one day in her 7th year she meets old one eye otherwise known as a good-for-nowt Outlander. Year after year he comes to her for a few weeks and tells her the stories of he Norse Gods as he teaches her various runemarks and how to harness her power. Being isolated Maddy spends in the time dreaming that the various Norse Gods are friends and famly to her. One morning Maddy is called to Mrs. Scattergood's to deal with yet another goblin infestation in the cellar when this time she manages to catch and correctly name Sma-rakki. In an effort to capture hold him she lets loose all of the bilge and vermin in the area rise from depths. She quickly leaves the cellar knowing that they will disappear in an hour but the racket draws the attention of Adam Scattergood, as Maddie races off to meet with the Outlander. It is at this meeting that Maddy is observed by Adam and her secret ability to perform magic becomes known. The Outlander sends Maddy on a quest to find the Whisperer long buried in One Horse Hill while he stays behind to deal with the townsfolk. The Outlander tells Maddy not to trust anyone she meets, well aware of exactly what is at stake. There is so much more to Maddy's quest than she realises. To be successful Maddy must heal the rift between the Æsir and the Vanir all the while gambling that Loki will not actually betray her. The Word feels that it's time for it to rule the world and will stop at nothing to cast aside the old Gods. It has gathered a host of followers amongst the folk and is determined to rule in Asgarde as the Gods of old once did. Can Maddy get them to leave the past as the past because the word represents not only a threat to their continued existence but to the nine worlds as well. If you are a fan of Norse mythology, I suspect that this book will catch you from the very beginning of its epic tale. It is so clear that Harris did a lot of research to write this book, with everything from the mythos of the Gods themselves to the runemarks she uses throughout the book. Though familiar with many of the Gods who appeared in this story, Harris skillfully builds on their stories while keeping true to the original tales. I found myself warming to the healer Iðunn and the ease at which she managed to block out the most desperate circumstances. I laughed at Loki's antics and wondered when people would finally get wise to the fact that he is no good. I was saddened for Hel and her tireless pursuit of Baldr - a love destined to be forever unrequited as he sits in death next to her on his throne - a shadow of his former self. Harris brought them alive for me in a way that was new and eer so compelling. Maddy is a really strong female lead, one who has powerful abilities and isn't afraid to go off and have her own adventures. She's also pretty realistic, by which I mean she felt like a real person to me, with feelings and dreams and a personality of her own. I also liked that she was really-- I don't know how to say it. Female? She didn't just seem like Ms Harris had taken a boy character and switched him into a girl-- Maddy was a real girl and her gender was an important part of herself. Does that make sense? I hope it does, because I don't think there are tons of female adventure types that actually like being a girl and want to do things as a girl; it always seems instead that they disguise themselves as boys or something (Shakespeare does that a lot in his plays). Anyway, the story is a really exciting one, with battles and magic and gnomes. It slows down a bit in the middle, and the ending was somewhat of a disappointment to me because it was sort of like Maddy had been pushed to the side in favor of Odin's subplot. But I had a wonderful time following Maddy along in her adventures, and the rest of the characters were sufficiently flushed out enough to not just become prop figures. One character who really surprised me was Loki, who nearly always is portrayed as an almost evil character, more malicious than mischievous (think American Gods, maybe). The Loki in Runemarks is very sympathetic, and it made me think of him more as a person who is trapped in a place he doesn't want to be, where he can't ever win and he has to look out for himself because no-one else will. I think he even says somewhere in the book that the gods are happy to use his talents when it suits them, but then sweep him under the rug (or try to kill him) when they no longer need him. So, yeah, that made me empathize with him more than despise him, even when he did try to trick Maddy out of something (he made up for it later, anyway). Joanne Harris is an Anglo-French author, whose books include fourteen novels, two cookbooks and many short stories. Her work is extremely diverse, covering aspects of magic realism, suspense, historical fiction, mythology and fantasy. She has also written a DR WHO novella for the BBC, has scripted guest episodes for the game ZOMBIES, RUN!, and is currently engaged in a number of musical theatre pr Joanne Harris is an Anglo-French author, whose books include fourteen novels, two cookbooks and many short stories. Her work is extremely diverse, covering aspects of magic realism, suspense, historical fiction, mythology and fantasy. She has also written a DR WHO novella for the BBC, has scripted guest episodes for the game ZOMBIES, RUN!, and is currently engaged in a number of musical theatre projects as well as developing an original drama for television. “In any case, fire burns; that's its nature, and you can't expect to change that. You can use it to cook your meat or to burn down your neighbor's house. And is the fire you use for cooking any different from the one you use for burning? And does that mean you should eat your supper raw?" Maddy shook her head, still puzzled. "So what you're saying is . . . I shouldn't play with fire," she said at last.